Our Ready Set Go! 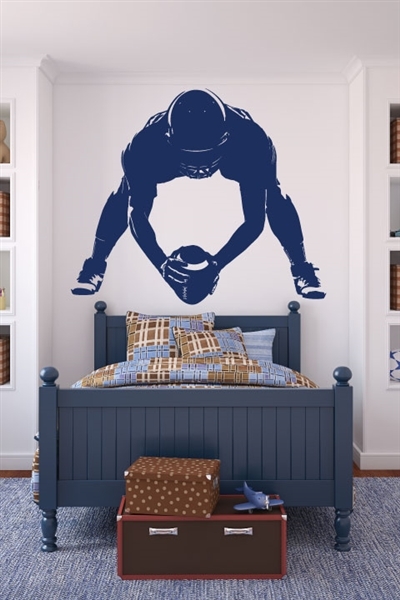 decal depicts a offensive lineman getting ready to hike the ball to his fellow quarterback. This decal is wonderful to portray that starting game action, getting ready to start the next play that could score their next touchdown (pictured in Dark Blue). Our Ready Set Go! Wall Decal is available in 32 colored vinyl options and various sizes. This decal can be placed soaring to the left or soaring to the right, it all depends on how you want to place it on your wall. If your decal is larger than 46in it may come in multiple pieces. There will be matchpoints to make installation easy.